At Any Price Movie updates How far will you go to chase a dream? added the tagline: "How far will you go to chase a dream?" Sony Pictures Classics has acquired all North American and Eastern European rights, excluding CIS and Russia, to Ramin Bahrani's family drama At Any Price. 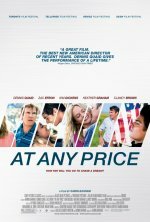 Story centers on a young man, played by Zac Efron, who wants to pursue his dream of becoming a pro race car driver, while his ambitious father (David Quaid) has alienated the whole family and set his sights on his son's succession. When a high-stakes... show all investigation into their business is exposed, father and son are pushed into an unexpected situation that threatens the family's livelihood.